Bunnahabhain [boon-a-haa-ven], the "mouth of the river", is the most northerly of the Islay distilleries. Built in the 1880s on wild, uninhabited wasteland, a community grew around the distillery. The buildings built to house the distillery workers and their families lie empty now and create an eerie feeling on the approach to this remote distillery. 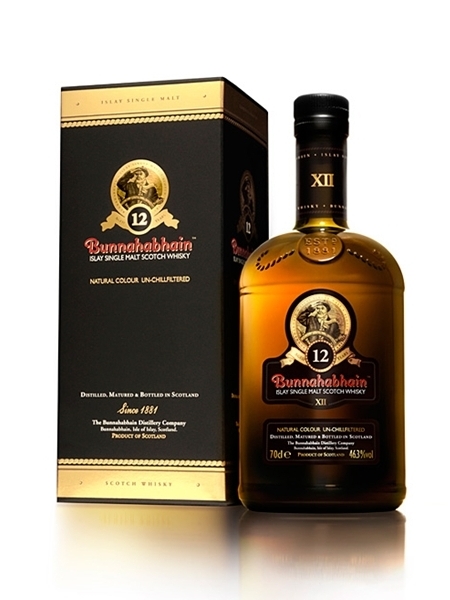 Contrary to the traditional peated style of Islay whisky, Bunnahabhain's tradition is unpeated whisky, although they have diversified in recent years. Mainly a producer for blends like Black Bottle, the 1970s saw their first single malt release. In 2010 the distillery announced that they would no longer be chill filtering their releases. They now boast natural colour, non-chill filtered whisky. This 12 year old is their entry level unpeated single malt, bottled at 46.3% ABV.